Fellside Lodge Self-cateringPine log cabin which is situated in landscaped grounds with panoramic views of the Lakeland fells within easy walking distance of Keswick town centre. 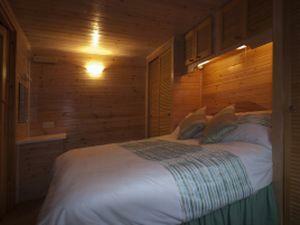 Fellside Lodge is a 1 bedroom log cabin, situated in Burnside Park and enjoys panoramic views of the Lakeland fells. The park is within easy walking distance of Keswick town centre with its many shops, attractions and places to eat. This makes the lodge an ideal base to enjoy the amenities of Keswick and also relaxing at a quiet location in picturesque surroundings at the foot of Latrigg and Skiddaw. Furnished to a high standard, double glazed, and electric heated the lodge consists of a spacious double ensuite bedroom, a bathroom with electric shower over full-sized bath. A very well-equipped modern kitchen and a large lounge/dining area with log effect fire, sofa bed, TV, DVD, video, Dab radio. French doors provide magnificent views of the surrounding fells and opens onto a terraced area with patio furniture. All bed linen and heating is included. Pine log cabin situated in landscaped grounds with panoramic views of the Lakeland fells within easy walking distance of Keswick town centre. Leisure complex, bowling green, pitch and pitt, tennis courts, boat hire, all located in the town. Marinas with full water sports facilities, a short drive away. Children welcome from any age. Fellside Lodge offers weekly bookings starting on Saturday and short breaks of 3 days starting on any day in some seasons. One-bedroom, pine log cabin. Fantastic views located in landscaped park, 12 mins walk to Keswick town centre. Private parking. From M6 jct 40 take A66 signposted Keswick. In approximately 17 miles ignore the first slip road to Keswick and continue along A66 for about 1 mile until you reach a roundabout, take third exit signposted A591 to Carlisle. Immediately take the first right signposted Ormathwaite and Underscar and then immediately again right into Burnside park. Continue along road and take the second left after the communal rubbish bins and Aaron Lodge is second on the left. From bus terminus outside Booths supermarket, turn left alongside to Main Street. Take a left and follow the road for about 250yds and take a right into Crosthwaite Road, continue along to a large roundabout. Take the second exit signposted A591 to Carlisle. Immediately take the first right signposted Ormathwaite and Underscar and then immediately again right into Burnside park. Continue along road and take the second left after the communal rubbish bins and Aaron Lodge is second on the left. We spent 7 nights here. It was clean, comfortable and quiet. Initially we thought it was a bit far from Keswick Town, but once we got the lie of the land it took a 10 minute walk to reach the centre. We would definitely recommend Fellside Lodge and Burnside Park to anyone and hope to stay there again. Thank you. there are three steps to the property, once inside it is all on one level but the shower is over the bath. Due to the size of the property it is not suitable for wheelchair users.